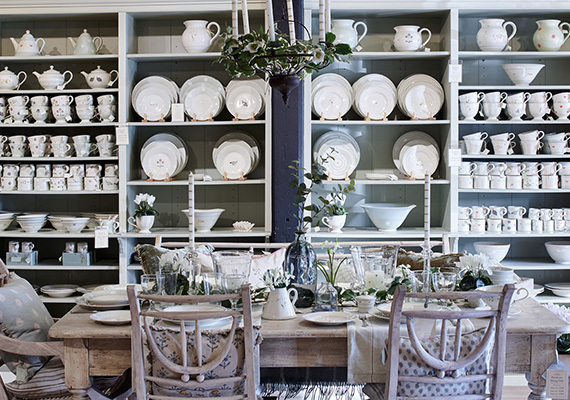 Situated in a charming market town, our Marlborough showroom is home to a wide range of our collections. You will find a selection of our key pieces, including our hand-carved furniture, hand-printed fabrics, handmade cushions and hand-painted ceramics. Our resident Interior Designer, Meg is here to offer advice and inspiration to create the perfect look for your home. 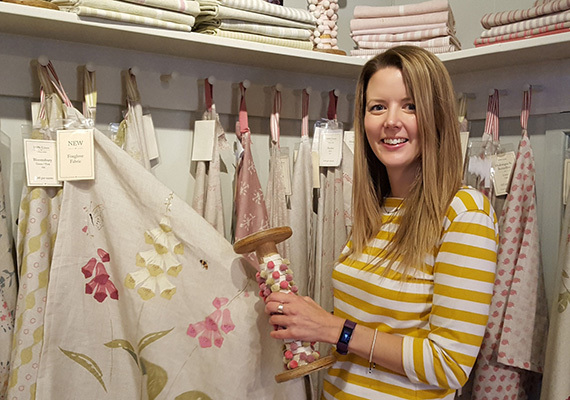 From cushion combinations to a bespoke full interior design service, Meg is on-hand to help you design and decorate your space. To contact Meg, please call 01672 516 647 or email marlborough.fabric@susiewatsondesigns.co.uk. Marlborough is set in the heart of Wiltshire's picturesque countryside on the River Kennet. The High Street is one of the widest in the UK and lined on both sides with characterful old buildings. 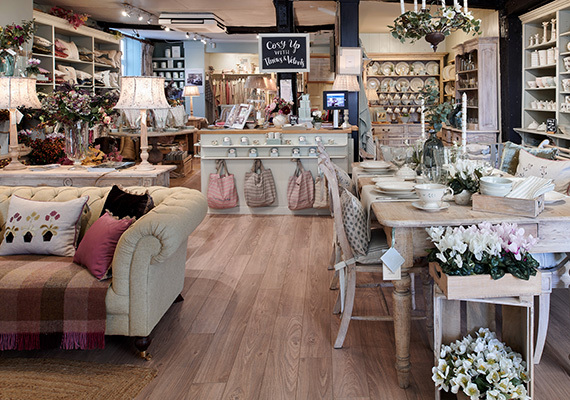 Our store is nestled along the High Street, opposite the famous Polly Tea Rooms. Set over two storeys, discover our soft grey bedroom downstairs, which features our Dove Grey Ivory Large Shalini Wallpaper and Full Upholstered Bed. Train Station: The nearest train stations are Pewsey Railway Station (6.5 miles) and Bedwyn Railway Station (7 miles). Dogs: Well behaved dogs are more than welcome in our Marlborough showroom. 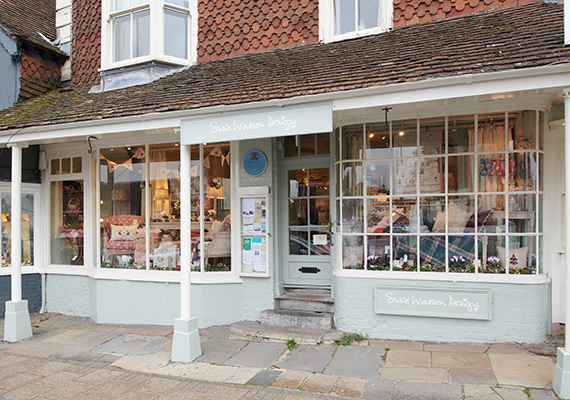 "Although Marlborough is quite a small shop, the staff are simply the nicest! … Thank you to Meg in particular who was very helpful, coming out to my home to measure and advise. The drawing room curtains look perfect in the red rose linen, particularly with the rose velvet and green velvet cushions plus Shalini and Moonflower. The bedroom is transformed with your stunning quilt and bed linen - a true luxury every single day. I'm about to start on the guest bedroom now…"
I wanted to write and let you know how delighted I was with the service on both occasions. All the staff were friendly and helpful and genuinely keen to offer advice. In particular, Ela was an absolute star; she was incredibly knowledgable, helpful and patient and took plenty of time to help us decide on fabrics and styles… I’m really excited about planning the rest of my new room." "The shop is just so delightful to visit, to browse around or better still to buy the amazing items in the shop. Very difficult not to find something to purchase. Staff are always so friendly and very helpful, service with a smile." "I visited your Marlborough store today and I just wanted to say that the customer service there was fabulous the shop assistant whom helped me along with the store manager were both lovely and ever so helpful. 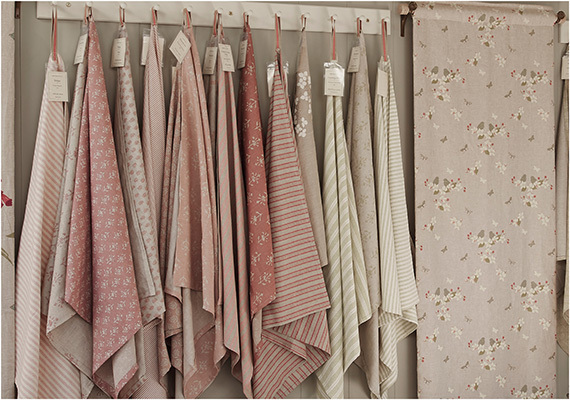 It is a lovely experience visiting that store, I can't wait to use the fabric that I purchased!"